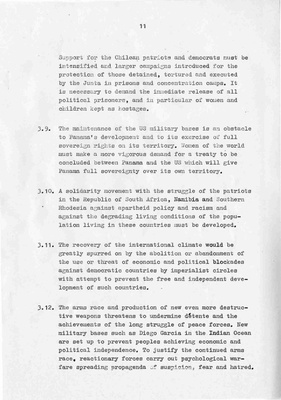 "International Women's Year, Berlin Paper, page 11"
From the papers of Dr. Usha G. Mahajani, this is page eleven of a working paper from Commission VI of the International Women's Year World Congress in Berlin, October 1975. The page discusses political tensions across the globe. Women and world peace is a focus of the Commission along with detente, international security and the environment. Mahajani, a Political Science professor at Central Washington State College [CWU] from 1967-1978, attended the IWY Congress as a delegate for India. "International Women's Year, Berlin Paper, page 11" (1975). Washington State Conference for Women, 1977. 256.